There has been a lot of talk about the decline of Apache’s dominance as a web server, with competition from IIS and other alternatives like Lighttpd, but Apache is still king of the hill when you look at the top 100 websites in the US. We here at Pingdom have noted a very wide range of web server software for the websites that we monitor uptime for. So, out of curiosity (once again) we decided to see what kind of web server software is in use by the most popular websites in the US. 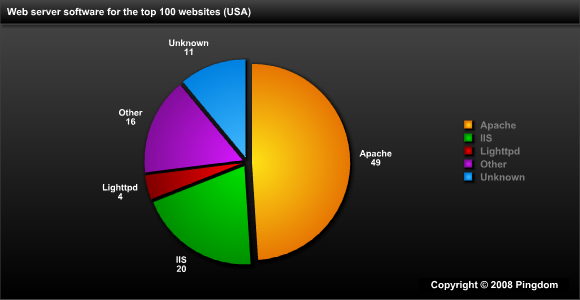 We collected this information by looking at the HTTP response headers for the top 100 websites (according to Alexa.com). The HTTP response header will usually reveal what web server software the website is running on. Though Apache and IIS dominate (together they have at least 69% of the top 100 websites), Lighttpd and some of the other smaller web servers have started to carve themselves a niche. It’s also interesting to note that only one out of the top 100 websites is running the much-touted IIS 7, and that is Microsoft.com. Here is a detailed breakdown of the numbers we collected. Any web server software with less than two websites was placed in the “other” category. Some HTTP response headers didn’t contain any information about the web server software and ended up in “unknown” (11 out of 100). The HTTP headers often contain a lot of interesting information. Here are some additional things we found out from the header information. 66 out of the 100 websites reported support for gzip content encoding. Small disclaimer: It is possible for websites to report incorrect information about the web server software in the header. This can sometimes be done for security reasons. You reported only one web server type for each web site. But sometimes one web site uses several web server. I guess Youtube is known to use lighttpd for static content but Apache for dynamic content. So I guess in this case you reported Apache ? Why is it interesting to note that only one is IIS7? It’s barely a month old! @Mack – Because any site would be crazy to run a bleeding edge webserver. I was surprised anyone was running that, until I saw it was Microsoft who kinda has to. Look how many people are still running Apache 1.3 and Apache 2 has been out for 6 years. Looks like WordPress.com has switched to Nginx. Do a server check on wordpress.com and its showing up as Nginx 0.6.29. Hone, you’re absolutely right. The response header definitely shows nginx now. Wonder when that happened? Netcraft shows the WordPress.com switch to nginx happening between April 8 and April 11. LiteSpeed’s ability to read apache httpd.conf and htaccess files makes it very attractive, beyond it’s incredible performance. Too bad no-one else is bothering to do that kind of compatibility with open-source because they’d get a huge number of adopters. Not a surprising result, given that Apache is often (though not always) used with Linux and MySQL, both of which are free, sort of. The upfront cost for the Linux O/S and MySQL DB are nothing, but the LAMP configuration is not without its drawbacks. In order to get really competent support for either of these systems, you have to purchase expensive time based support contracts from third party resellers (e.g., Red Hat) or the author (MySQL AB). Admittedly, the .NET / MS SQL configuration involves higher upfront costs due to license fees, but the support can be alot less expensive, especially for reasonably competent developers. A single incident support ticket at MS is only $99, compared with hundreds or even thousands of dollars per year for LAMP support. The bottom line is that in evaluating cost, you need to look at average annual cost of use, instead of just looking at the first year. I admit I don’t know which platform would win based on this standard, but I’d be willing to guess that the LAMP cost advnatage, if in fact there is one, is alot less than most people think. So long, and thanks for all the FUD. Support costs are about the same when you involve competent IT and Development staff. In fact, paying for support directly from an Open Source vendor is more akin to ‘getting a license’ and can’t really be compared to “$99” support calls to Microsoft. But its been my experience that Open Source developers are generally smarter, know how their technologies work at a more intimate level, and are generally better looking then their Point and Click counter parts.